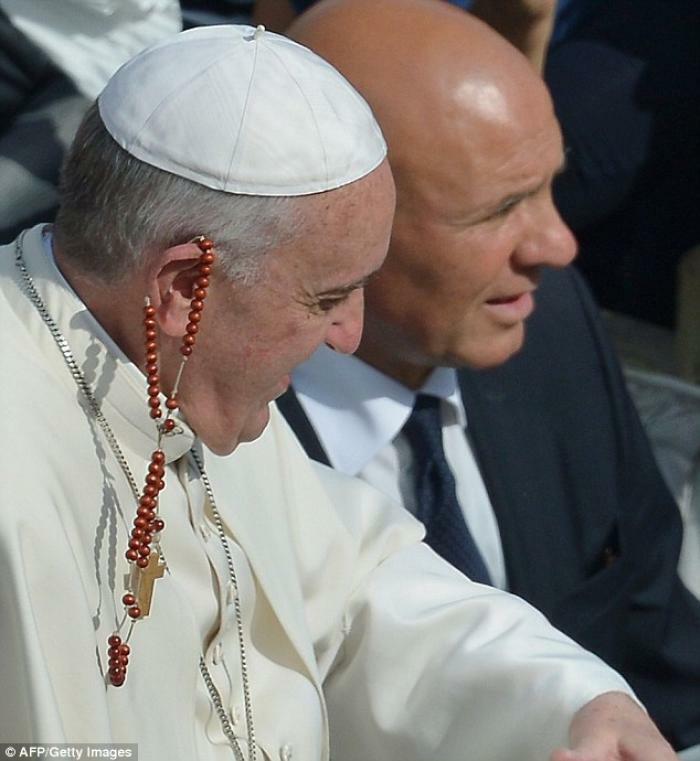 Pope Francis received an unexpected gift in a surprising manner today. Pope Francis caught a rather unexpected gift tossed to him from a crowd of well-wishers in St. Peter's Square. A simple rosary of wood and gold was tossed to him, and he caught it with his ear. 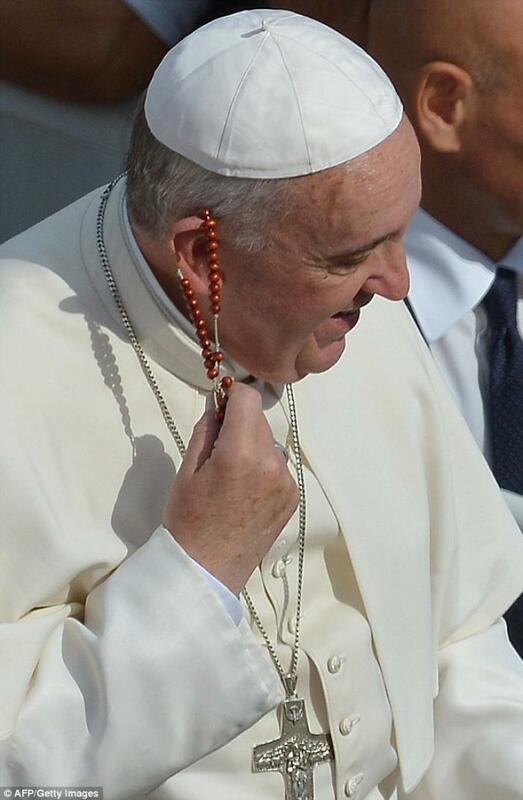 Pope Francis caught a rosary with his ear yesterday. ROME, ITALY (Catholic Online) - The Holy Father was celebrating the Marian Day Mass with a visit to St. Peter's Square in the Popemobile. While waving at onlookers, a pilgrim tossed a rosary to him, which hit his face and hung on his ear. The beads hung on his ear for a moment before he realized they were there. For a moment, the Holy Father did not notice the gentle gift that looped on his ear, then was momentarily startled by it and pulling it off, he appeared to chuckle to himself. Despite his austere lifestyle, which has been widely publicized, Pope Francis has been the recipient of a few gifts, including another rosary that was tossed to him, and he caught, last June. Surprised by the gift, Pope Francis gently removed it from his ear. The new rosary was put safely into his pocket. It is unknown if he will use the simple and elegant gift for prayers. Pope Francis has eschewed the finery and garb of his predecessors, choosing instead to live simply and without the adornments of office. He has called for the Church to be poor and to serve the poor, entirely consistent with the mission of Saint Francis and Jesus Christ. Last month, the Pope also received another gift, an old car driven by an Italian priest on his daily rounds. Pope Francis now drives the car himself to get around the Vatican, much to the alarm of his security detail. 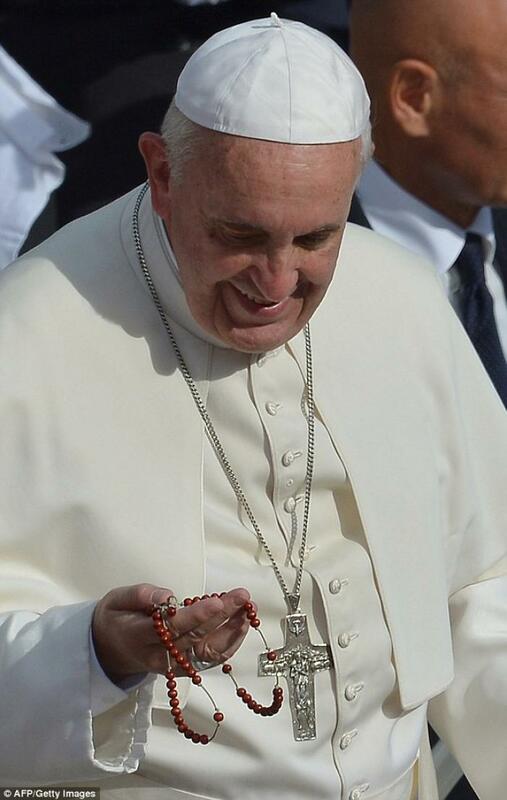 The is the second time the Pope has caught a rosary tossed at him. Although Pope Francis is very popular with Catholics, his security detail likely isn't so enthused. Pope Francis continues to plunge into crowds and to interact with pilgrims as though he were just another member of the clergy, creating security hazards that previous Popes avoided. However, Pope Francis has come to no harm and has within the space of months revitalized enthusiasm in the Church because of his simple, man-of-the-people personality. 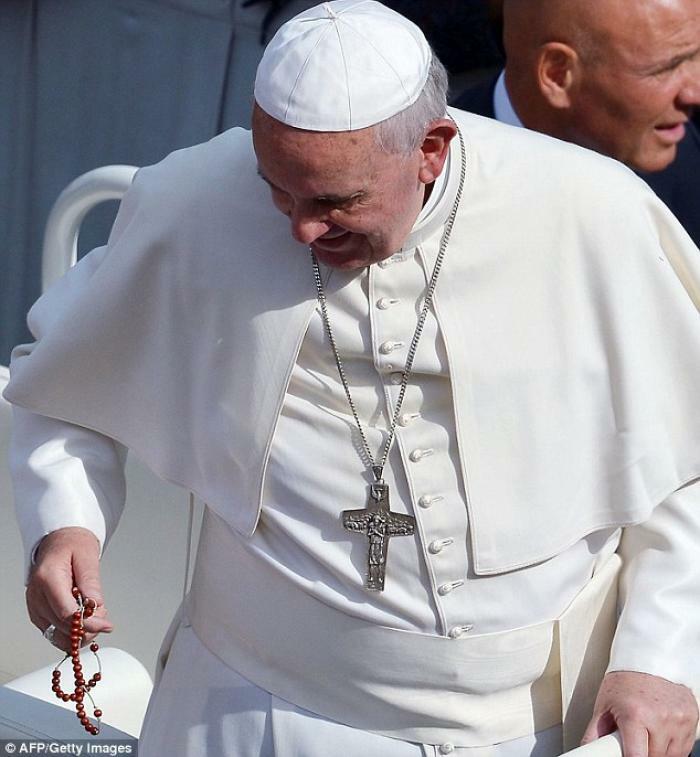 Pope Francis put the rosary in his pocket as he finished greeting pilgrims in the square. One question remains, was it blessed? A birth foretold: click here to learn more!